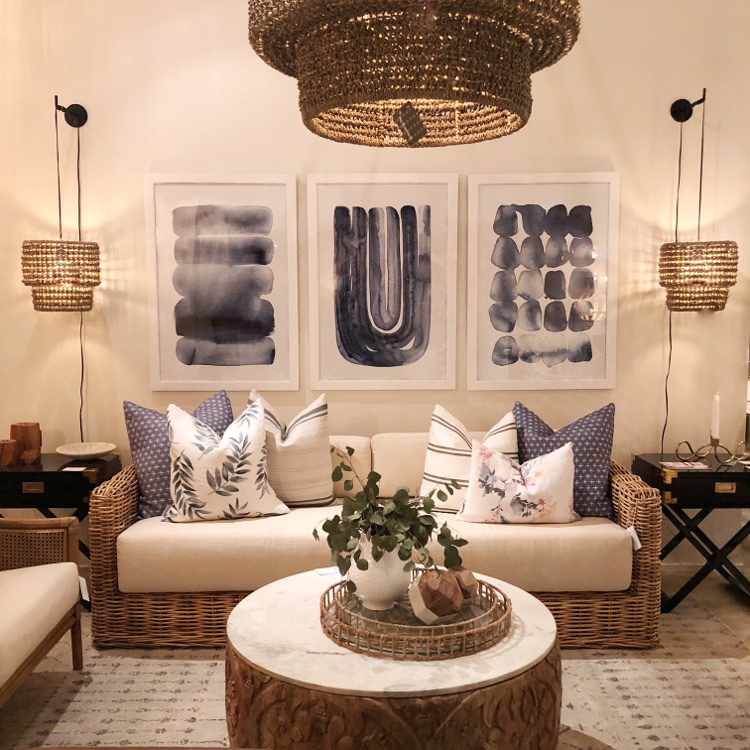 Now that the reveal of my One Room Challenge is behind me I am finally getting around to sharing all the fabulous things I saw at High Point Market. As in the past, I am breaking my trend report into two parts. 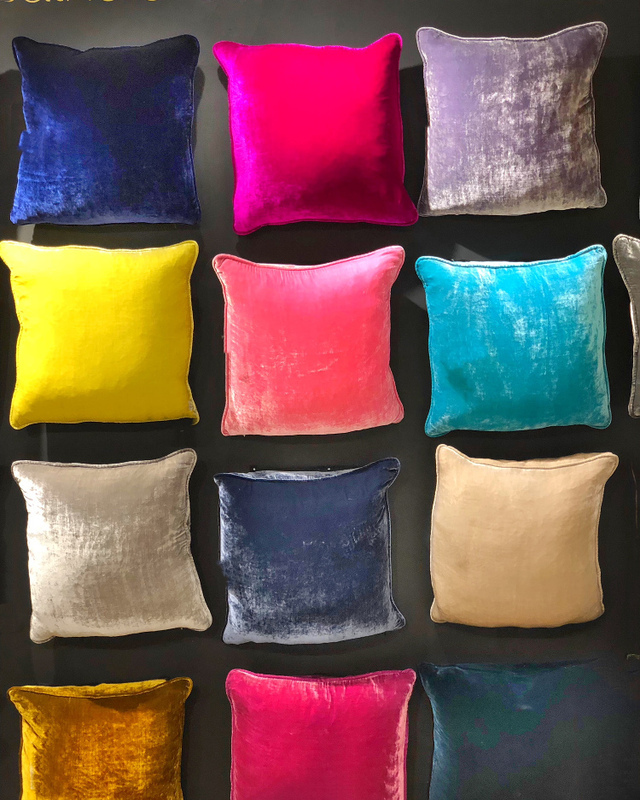 Part one is Color Trends and part two will be home decor trends. 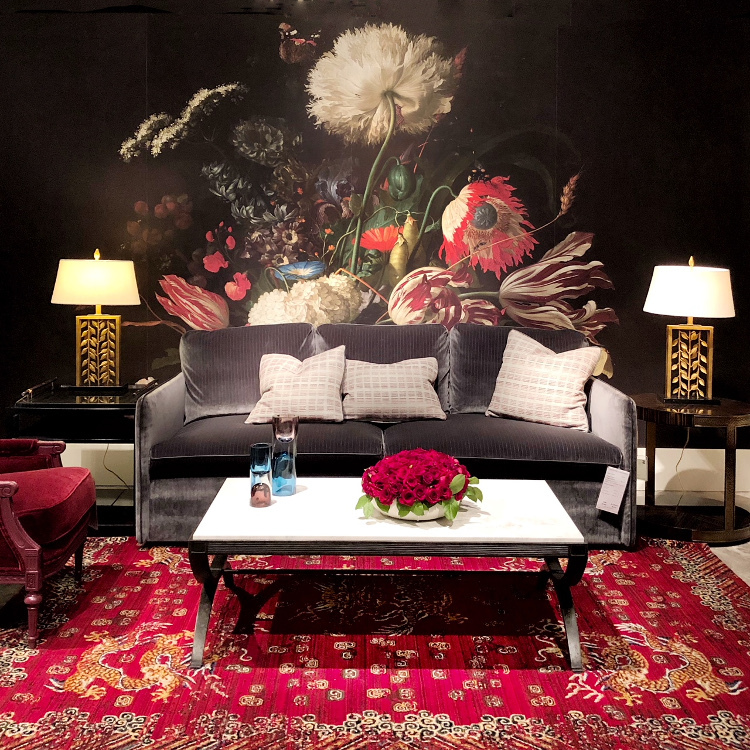 One of the things I look most forward to when attending High Point Market is to scope out the color trends. 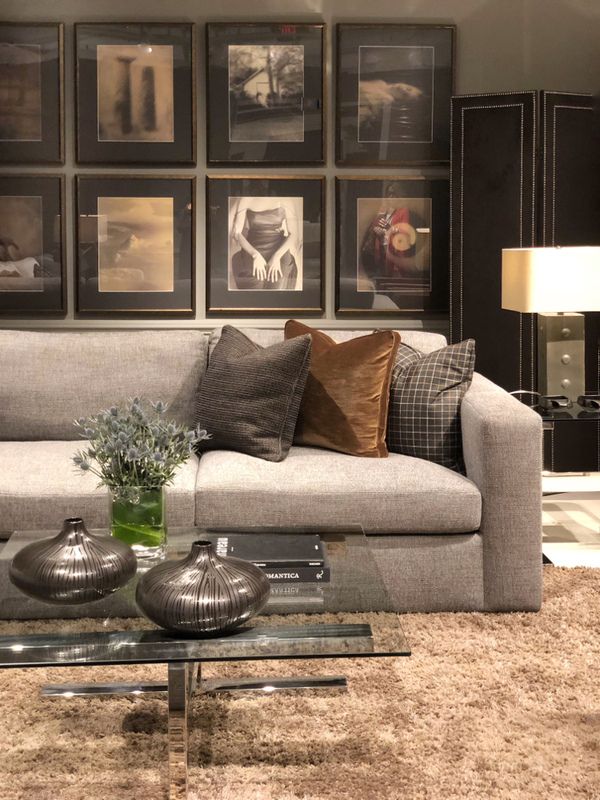 For the past few years the showrooms have been dominated by gray. Gray furniture, gray walls, gray carpets. For a color lover like me it can be quite depressing. Therefore, when I do see color, I am like a moth drawn to the light and out comes my camera (iphone) to record it. 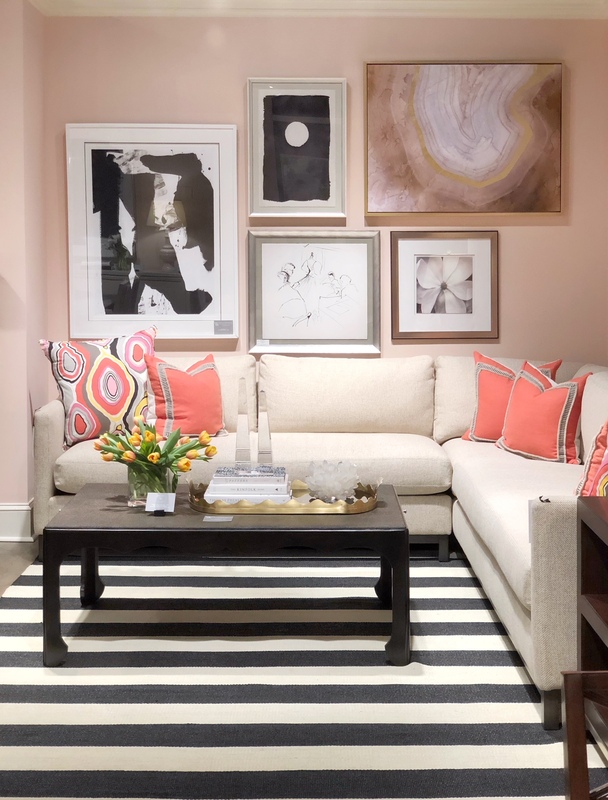 When on the search for color, pretty much every color can be found between all the many different showrooms. There were however certain tones and shades of each color that I saw repeated over and over. 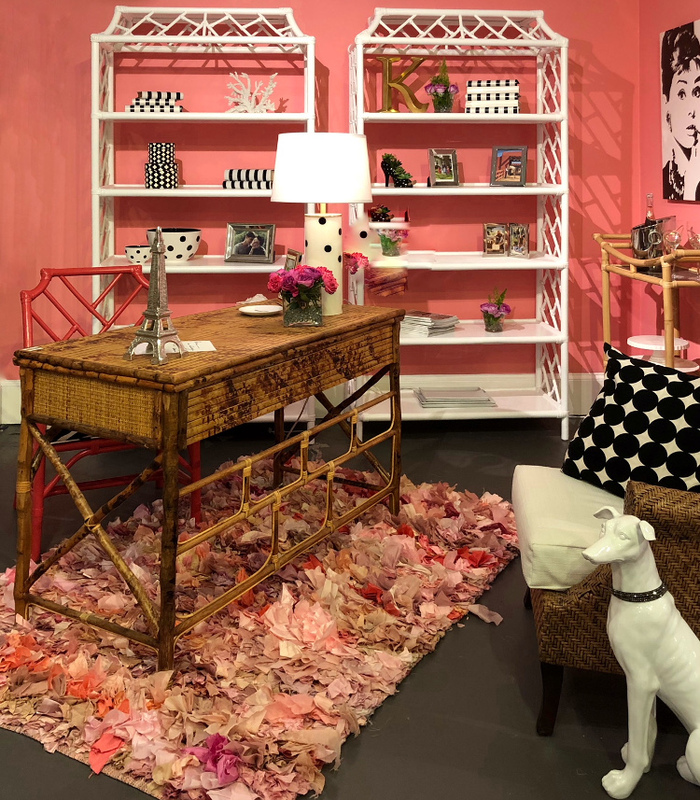 Since photos say so much more than words please enjoy the color trends from High Point Market 2018 in photos. Note: all photos by Linda Holt taken on my iphone. 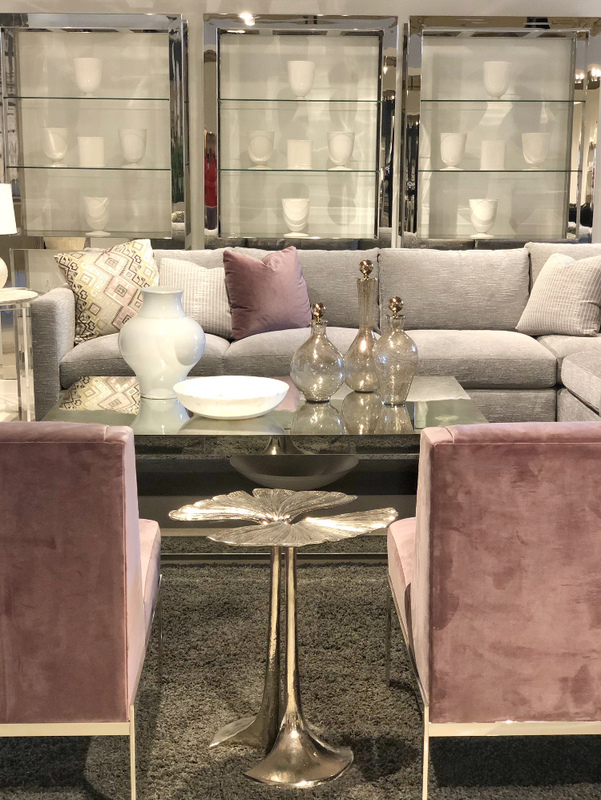 I can say with conviction that neutrals continued to out number “colors” at Spring High Point Market…by a lot! 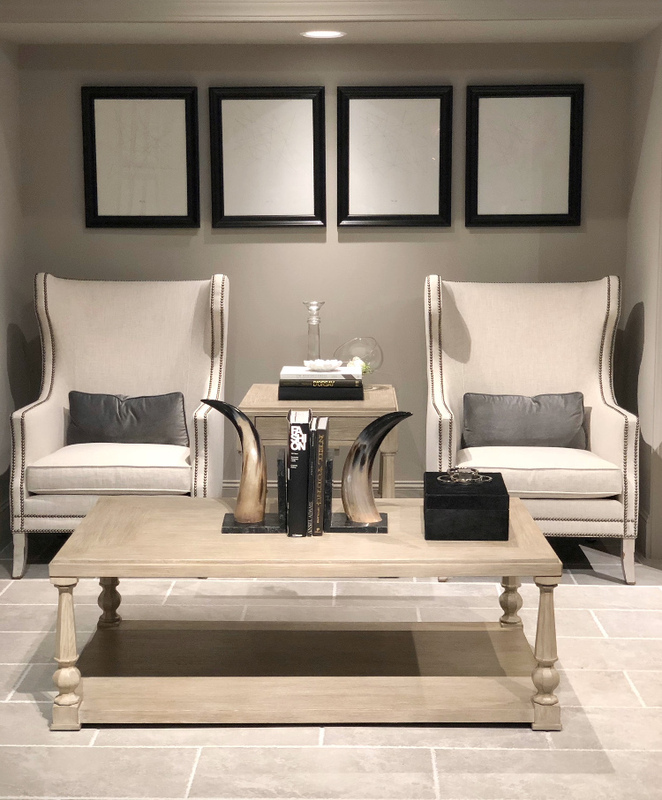 Gray, Greige, Beige and Taupe were more often than not in every showroom. Surprisingly, I even spotted the much (designer) maligned “pink beige” on both upholstery and in the carpet above. 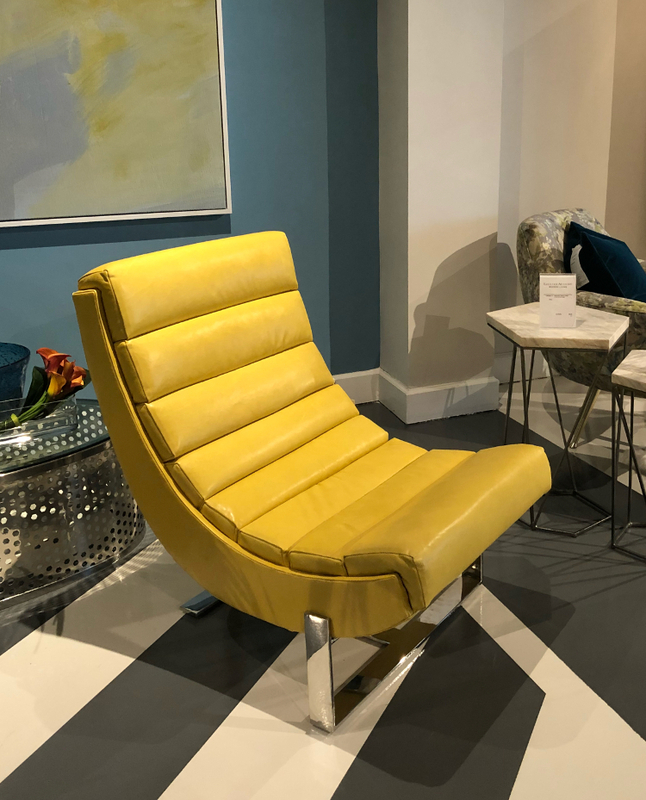 White walls were not as prevalent as they were a year ago but white sofas and chairs dominated this market. White upholstery was shown partnered with both other nuetrals as well as bright color. Now that Crypton and Crypton-like fabrics are standard with most manufactures white upholstery is now practical. 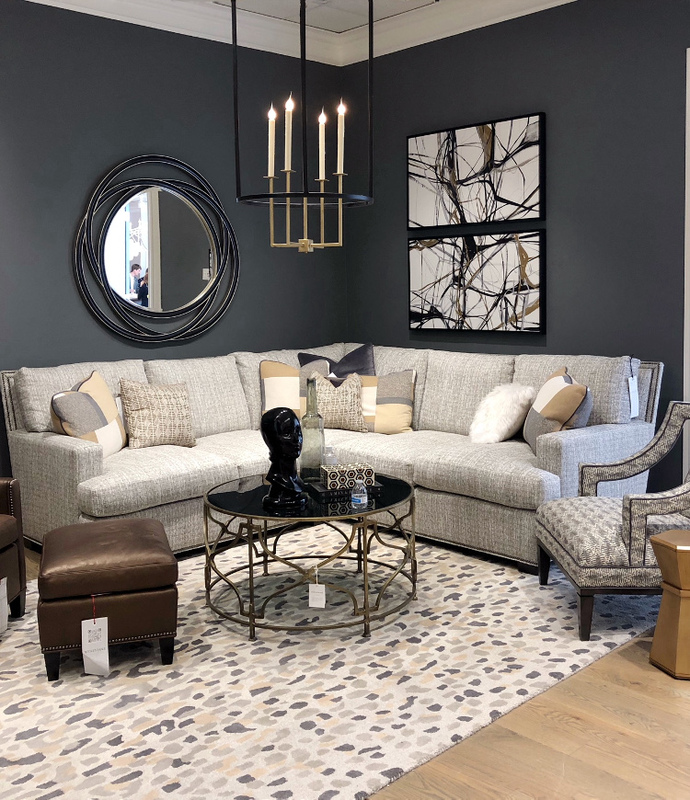 White sofas were the most common but gray sofas came in second. I did see more warm grays and greige but cool blue grays were represented as well. 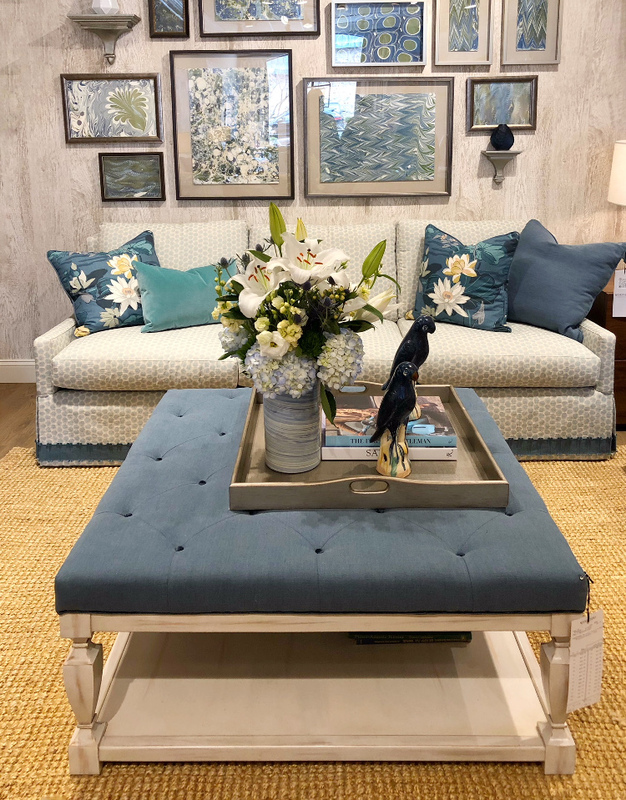 Blue is such a classic color that it’s almost like a neutral and as always, blues were popular at Spring Market. 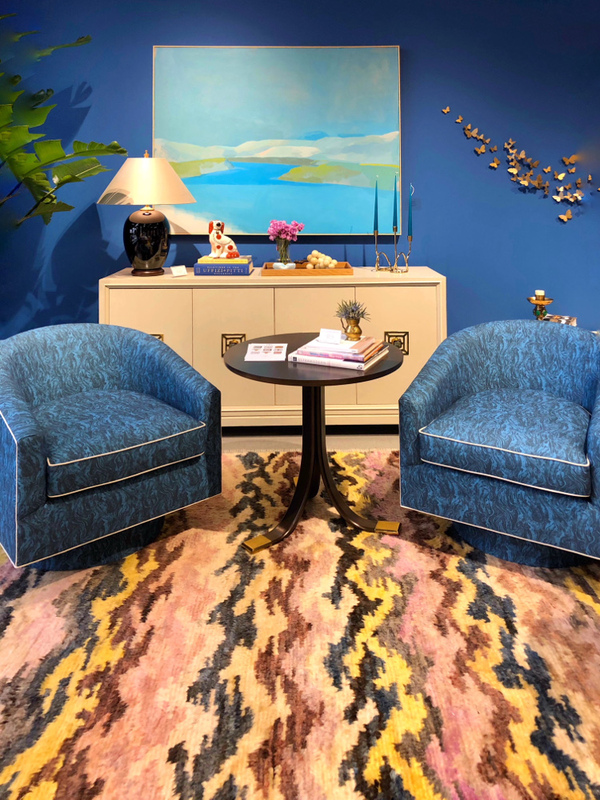 Deep vibrant blue was spotted in several of the showrooms on both the walls and on furniture. How beautiful is this rich aqua velvet settee? 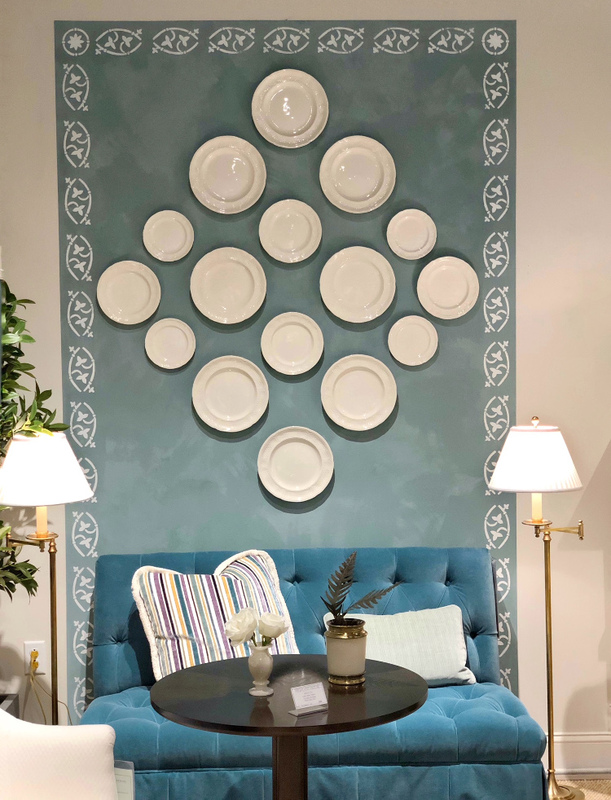 I also like the DIY stenciled wall treatment with the collection of plain white plates. 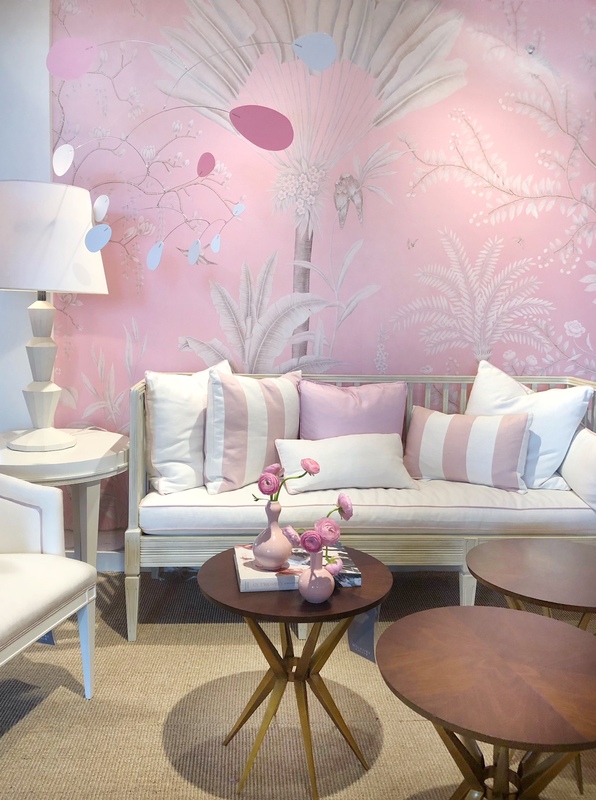 Millennial pink, which is what designers have been calling soft pink was also well represented at Market. Not only did I see soft pinks but richer brighter pinks as well. 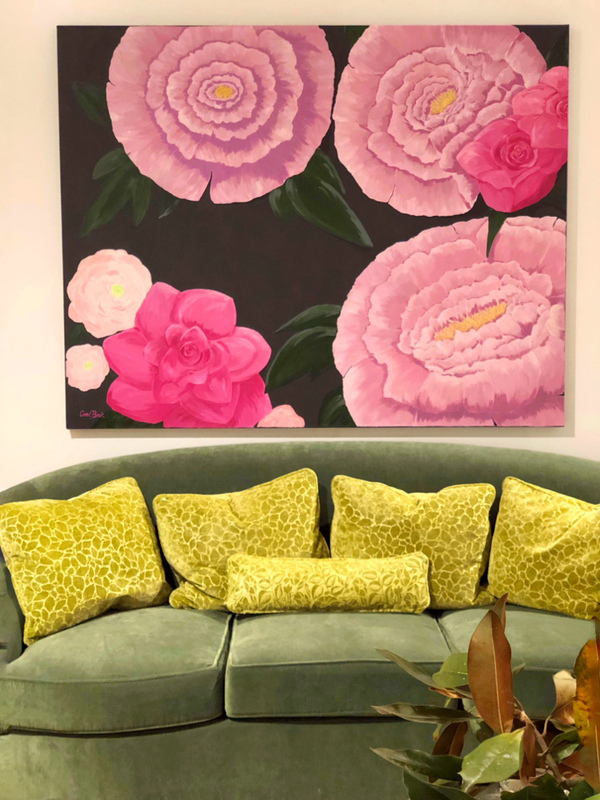 When using such a traditionally feminine color on the walls, one designer trick is to add black and white to keep the room from feeling too sweet. 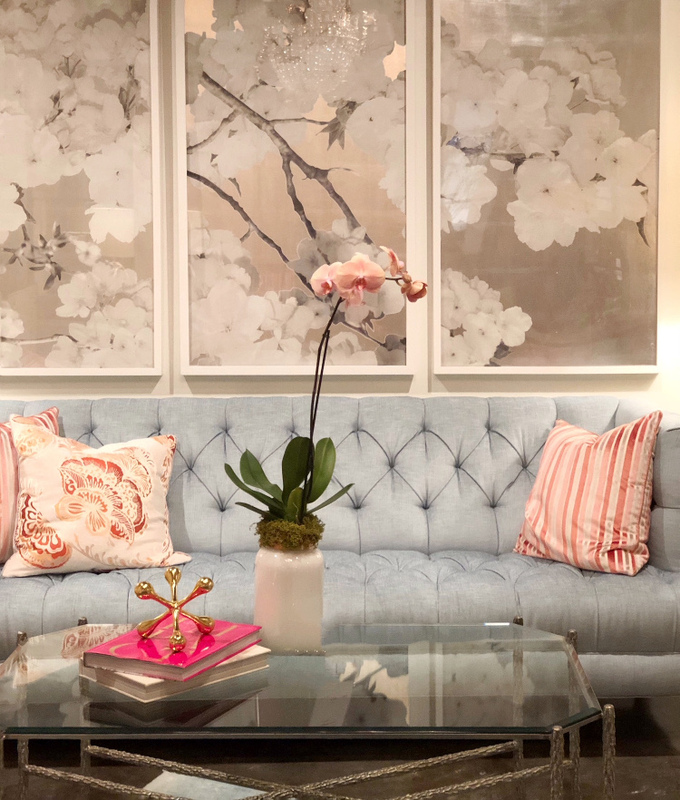 Notice also the coral pillows which I also think is trending heading into Summer. 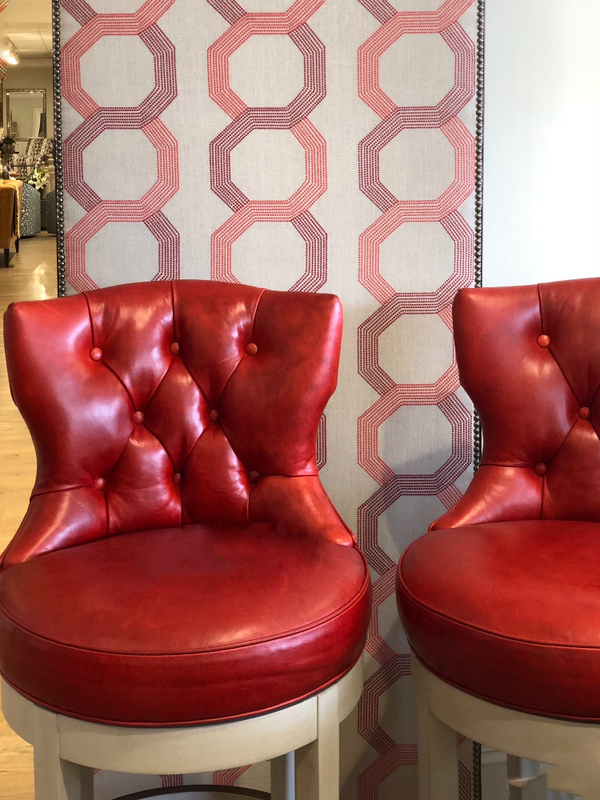 I saw coral used on both walls and Upholstery. 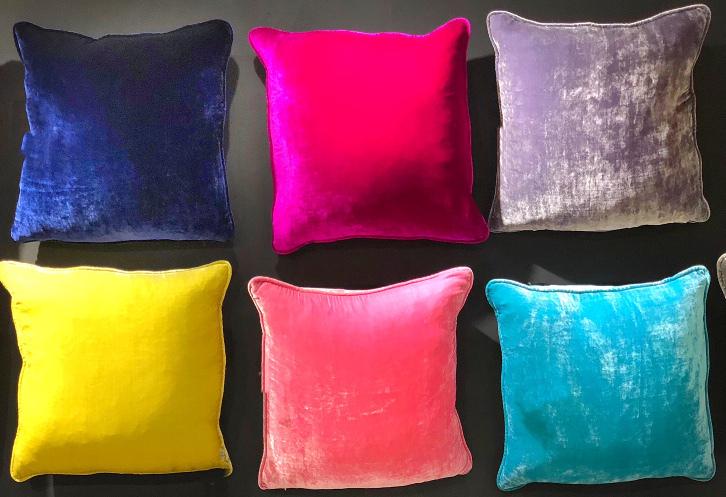 Rich jewel tones were also trending this market, especially in accent pillows and accessories. The rich jewel tones look so fabulous against a white sofa. 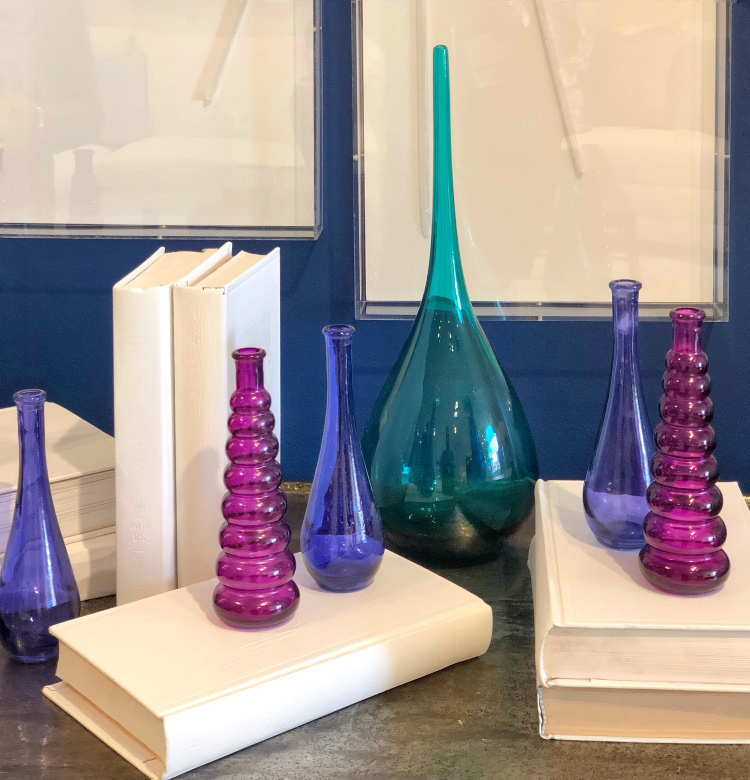 Jewel tone accessories are a great way to add some color pop without changing your wall or furniture colors. 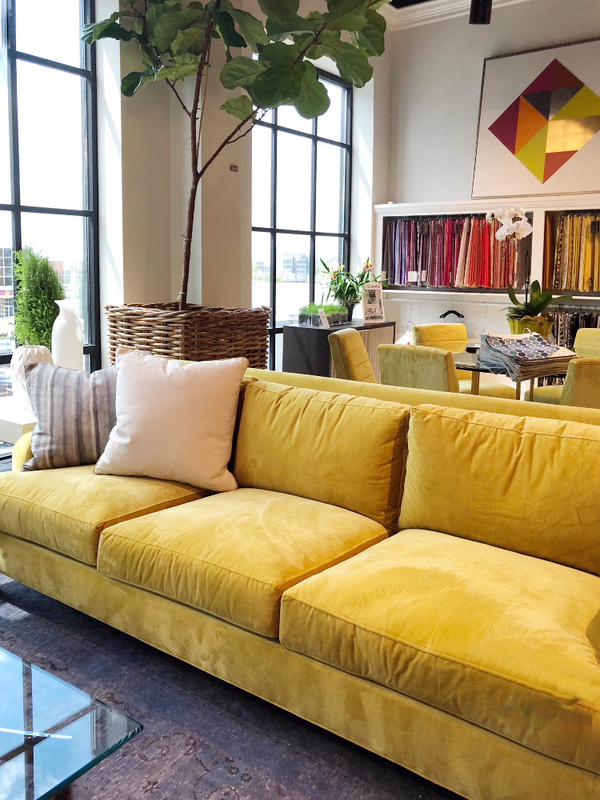 I was probably more tuned into yellow because I had just chosen a rich saffron yellow for one of the sofas in my One Room Challenge. Even so, I was surprised and pleased to see several yellow chairs and sofas. 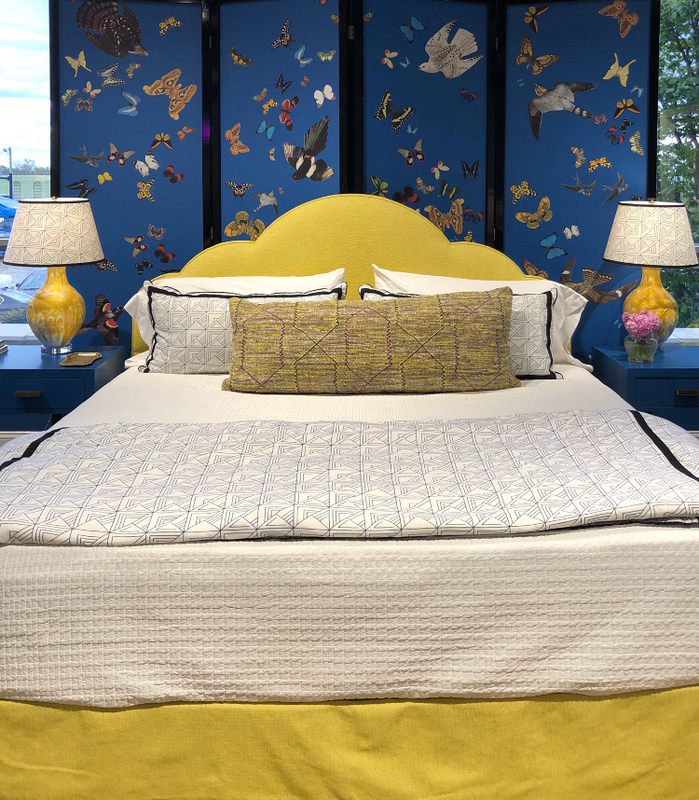 Yellow is such a happy color and adds so much life to a room. Green is still a favorite and the hues I saw ran the gamut from fresh Spring green to deep jewel tone green. 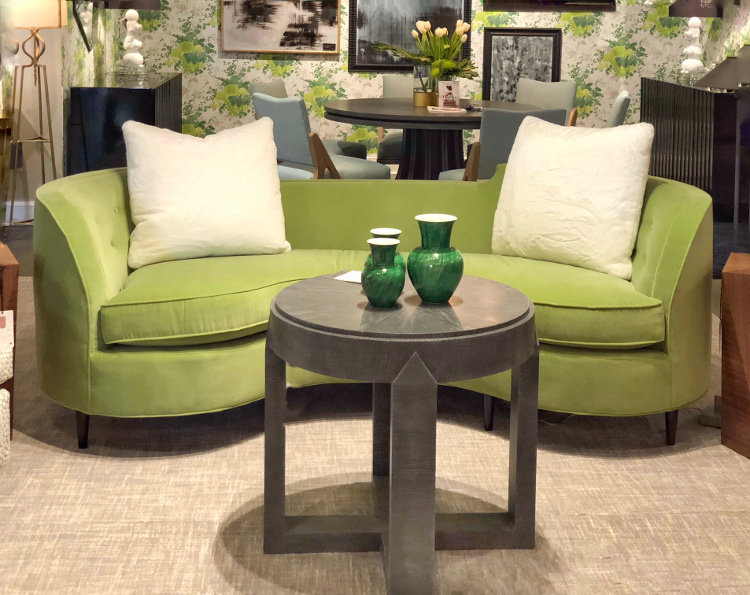 No muted greens for Spring market but bold and bright fresh greens. 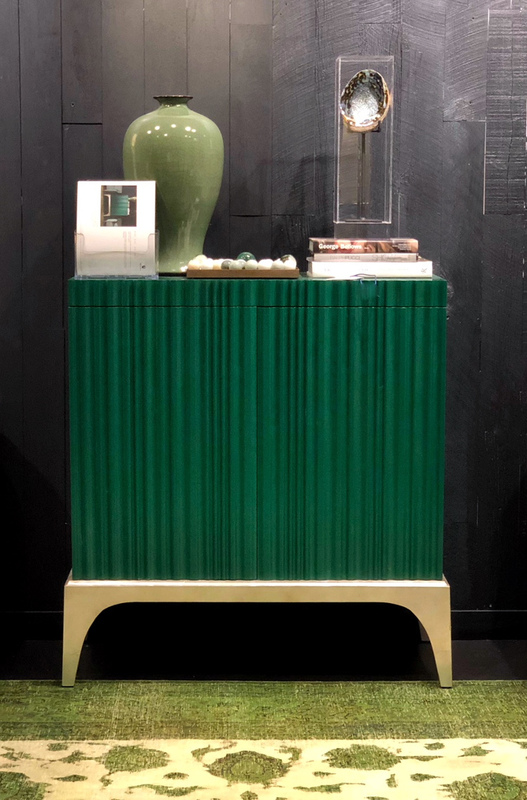 This malachite green chest had me at hello. Red also popped up in a few showrooms. Not a muted red of years past but a bold and bright red that said “look at me”! I’ve always felt if you’re going to use red pick a bold and bright hue. So what was my Color “take away” from visiting all the showrooms? That grays are still popular but are now mixed in with bolder and brighter colors. 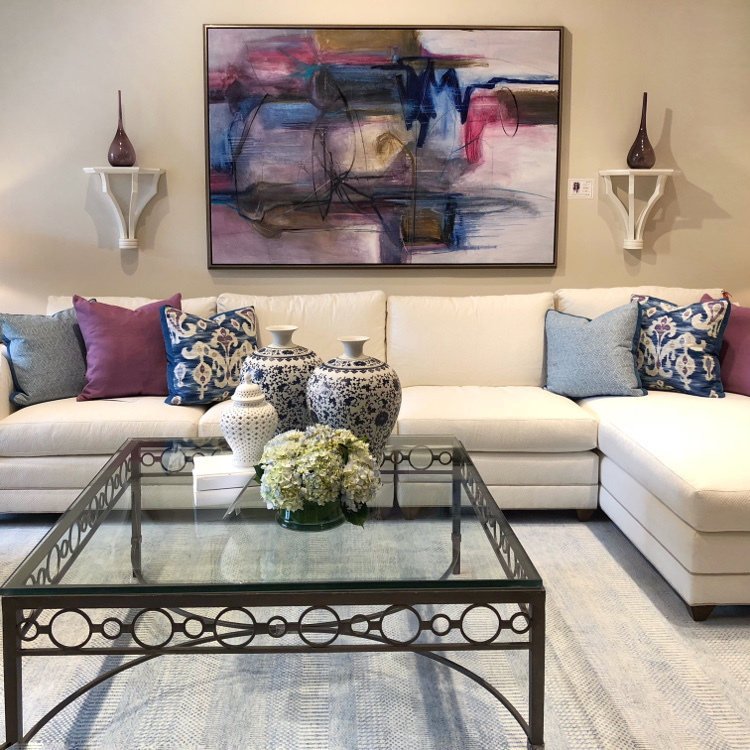 White and off white is the hot new color for upholstery items and overall, home interiors are moving toward incorporating more vibrant and bolder hues. Black and very dark walls, art work and wallpapers are also trending. 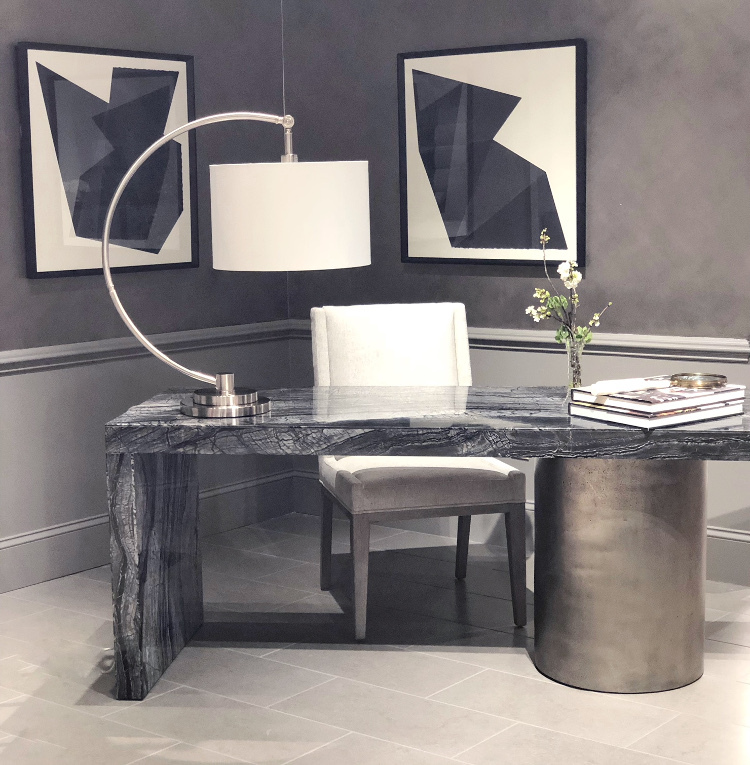 Be sure to check back next week as my next post will show you all the latest trends in furniture. Thanks for the update. Glad to see color is back! Me too. I’m not happy unless there is plenty of color in my life! Wow, what fantastic photos Linda! As I wasn’t able to go, your posts are so very important to me, thank you for making me feel like I was there! Thanks so much Jil. I love sharing what I see with everyone. I just love colours. All these pictures are beautiful. I just love them. Thanks a lot for sharing the post.